Zombies are so hot right now. And there’s no zombie franchise as hot as The Walking Dead. In a series spanning comics, television, novels, and games, The Walking Dead has told several variations of the zombie story. With each new entry in any of the mediums, the question remains: where do they go next? The Walking Dead: A New Frontier places the series over 5 years after the initial zombie breakout. Starring an all-new protagonist, Javier “Javi” Garcia, A New Frontier follows a different path. Unlike the previous seasons, A New Frontier opts to tell a story with a much more focused plot. This season, like the recent comics and TV episodes of the franchise, focuses almost entirely on human to human interaction. Throughout the five episodes, I never felt like the titular walking dead were a real, unpredictable threat; which is perfectly reasonable. While zombies may be the selling point of the franchise, they can only go so far narratively; any survivor worth their salt at the five year point should know how to dispatch the dead. At this point, the games/TV series/comics have minimalized the danger of the zombies to no more than a plot convenience. Now the survivors we follow face an even more dangerous, intelligent threat in post-apocalyptic world, humans. This season tells the story of Javi along with his brother’s wife and kids as they survive on the road; while occasionally flashing back to the Garcia family’s first days in the apocalypse. The family has opted to survive by living in their family van and restocking pit stop to pit stop. The survival plan hits a rough patch when Javi raids a junkyard that has been claimed by a new society that emerged in the wasteland, the titular New Frontier. Naturally, they become neck-deep in a feud between The New Frontier and outside settlements. In fact, the majority of the game takes place in established settlements with their own cultures and rules. For fans of the previous seasons wondering how past choices will matter with seemingly an entirely new cast, fear not. A teenage Clementine does make an appearance and becomes a major factor in the progression of the story. However, the choices made in Season 2 seem to be at an all-time low in terms of plot impact. 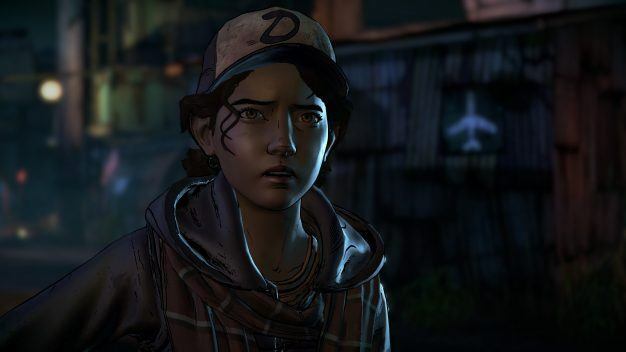 Clementine will have an intro flashback corresponding with your final Season 2 choice and lines referencing what she has done, but that’s the extent of the impact. It feels like a cop out in some aspects, but I could appreciate the earnest attempt to make the past seasons matter in a game so obviously dedicated to introducing new characters and moving the plot along. To A New Frontier’s credit, these characters are introduced in a story that kept up the emotional stakes of past seasons. The twists pulled may not have always blindsided me as intended, but it was a fun ride throughout. I cared about the new protagonist and felt a real weight to what he experienced and the actions that he took. Javi is a fantastic character to add into the series, but most of the side characters not named Clementine felt too one-dimensional. This feels like a grave misstep as it squanders a portion of Javi’s potential. In respect to nearly every other aspect of A New Frontier, it is a very “by the books” Telltale experience. You make choices, look through items, feel emotions, and marvel at the puppet-like characters. The Telltale Tool engine is impressive in the fact that it has been so heavily used over the past 12 years, but it is in desperate need of an upgrade. Graphically, Telltale has a distinct style, but I’ve always encountered wonky glitches and stiff, robotic animations in every game I’ve played from the company. There’s a limit to the Telltale Tool engine and the company is reaching it fast. One can only hope Telltale has assigned a team to produce an engine upgrade while they keep pumping out episodes. 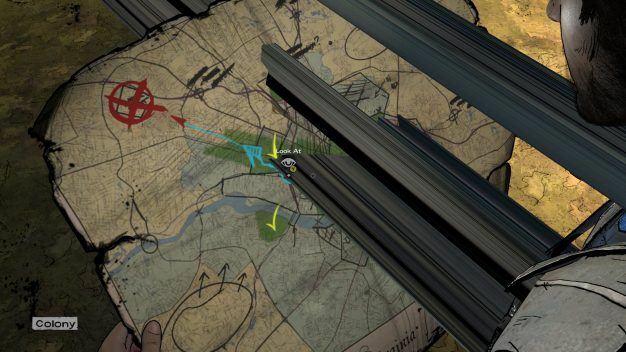 The entirety of episode 4 I saw Javi’s backpack stretched across the screen, clipping through objects such as this map. The Walking Dead: A New Frontier is one of the better narrative adventure titles that Telltale has released, and is a fine addition to the Walking Dead series; however, the games by Telltale are becoming too formulaic. 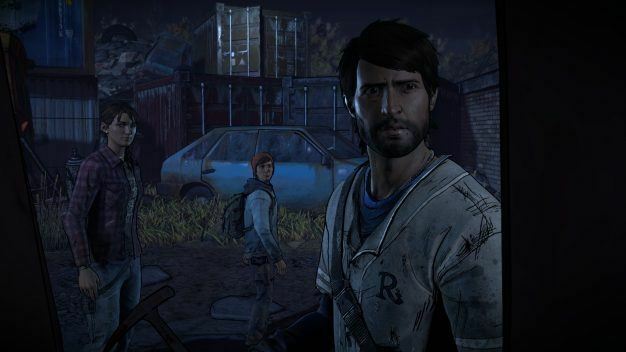 Telltale needs to shake things up with each of their running series to make them feel more distinct outside of the IP used. With games like Until Dawn and Life is Strange taking the concept of the Telltale formula and providing their own unique spin, it’s about time Telltale themselves change their approach. The Walking Dead: A New Frontier unfortunately wasn’t the game to pull off that much needed shakeup, but the story it delivers is still solid for the choose-your-own adventure genre. 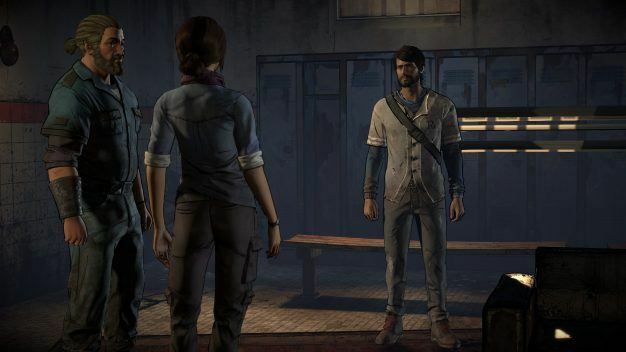 Fans of the Walking Dead franchise will find a lot to enjoy here, but players burnt out by the Telltale formula won’t find any fresh air in A New Frontier.